You know when you are craving several things at once? Right now I am really into cheese, berries, and balsamic (surprise, surprise, I know). I thought it would be a great idea to smash all of these glorious things on top of a beautiful little burger this time. You HAVE to try these sliders (and you’ll have to bear with me on the title because I couldn’t shorten it. Nope, not one tiny bit). Please please puh-leeeeeease make these. They will change everything you ever thought about burgers. Seriously. These are a game changer. 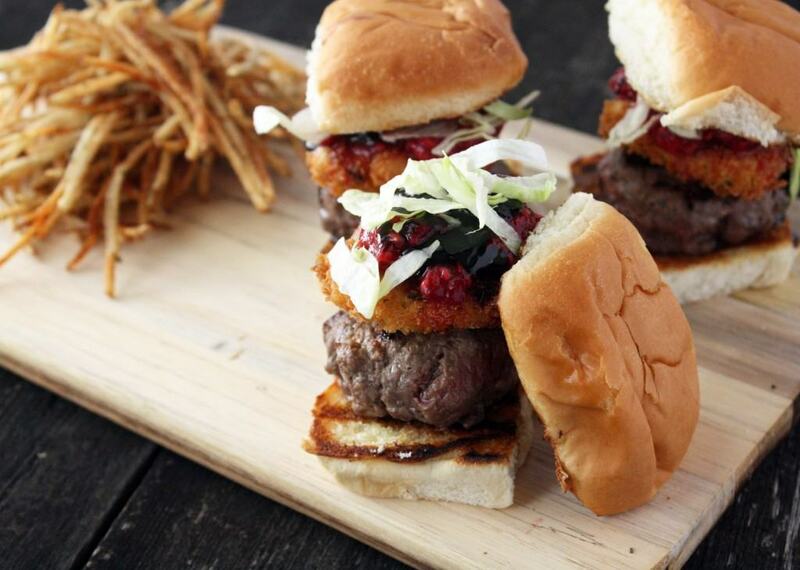 What really makes these sliders amazing is the fried goat cheese and raspberries. Tart, sweet, tangy, and crunchy. It’s like a fireworks show in your mouth. Exploding awesomeness with every, little, bite. I am sure all these flavors in one burger will come as a big surprise to any of you who have actually seen me eat a burger. I am a burger simplest. Generally I stick with blue cheese and ketchup (lots of ketchup) with some pickles in the mix. Oh and fries. Lots of fries. With ketchup. Ugh I know, I am basically a 5-year-old when it comes to burgers. I am going way outside of my normal burger style with these sliders and I just have to give myself a little pat on the back for that one. I like to think of myself as a slider-genius here but really it was me craving a crazy combo of things – and meat. Gotta love the meat, right? A surprising, yet incredibly delicious combination of cheese, raspberry, and balsamic that will have your guests begging for more. 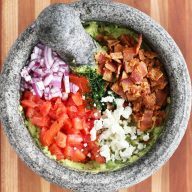 Set up your bowls for dredging. In a small bowl, lightly beat an egg. Put the flour in another small bowl. In a third small bowl, combine panko, garlic powder, and parsley. Cut the chilled goat cheese into 12 rounds. Add enough oil to a medium sauté pan so it is about ¾" deep. Heat oil until shimmering over medium-high heat. To fry the goat cheese rounds, start by packing the cheese between your palms so it sticks together (the cheese might crumble a bit, if it does this continue to work it between your palms until it is packed into a round disc). Dredge each piece of goat cheese in flour, then egg, and then the panko crumb mixture. Add to the oil and fry until golden brown on both sides (approximately 30 seconds to 1 minute per side). 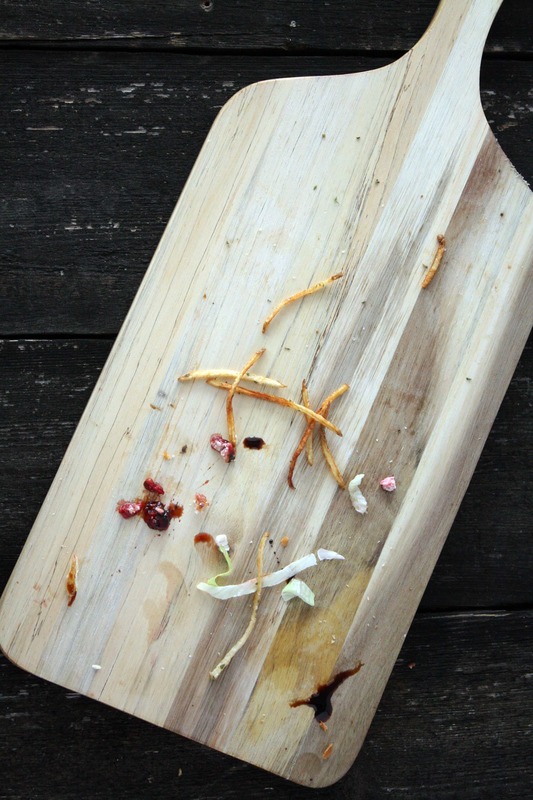 Remove and allow to drain on a plate lined with paper towel. 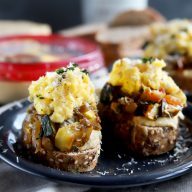 Repeat until all of the goat cheese rounds have been fried. Set aside. 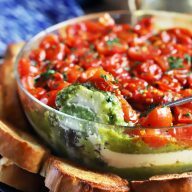 Add balsamic vinegar to a small saucepan and bring to a boil over medium-high heat. Reduce until the vinegar is thick enough to coat the back of a spoon. Remove from heat, stir in ¼ tsp pepper, and set aside. Form ground beef into small patties and season with salt and pepper. Grill each patty until medium to medium well (approximately 3 minutes per side). 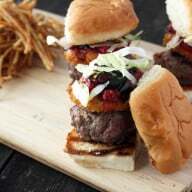 Once your slider burgers are done, build your sliders! 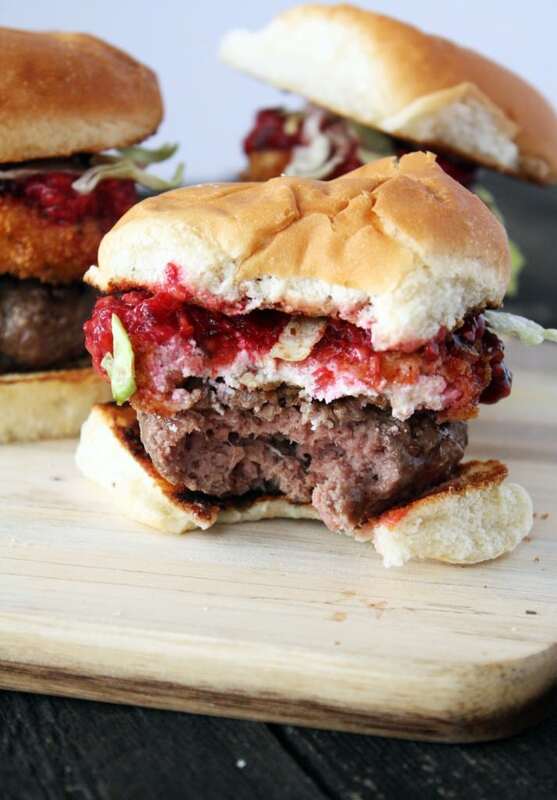 Add the beef patty to the bottom of a toasted bun, top with fried goat cheese, smashed raspberries, balsamic reduction, shredded lettuce, and top with the other half of the toasted bun. Repeat until all your sliders are built. I think I’m in love. That goat cheese/raspberry combo is screaming my name! It’s the perfect tart/tangy/sweet combo! I will forever add everything I am craving to a burger – best decision ever.